Most of my mountain flying experience has been in my beautiful Lancair IVP, high above the terrain looking down and enjoying nature’s beauty. I've flown in Utah and Idaho, but mostly at comfortably high altitudes. I heard about Jason Miller’s mountain flying course through his organization, The Finer Points of Flying, and decided to sign up. 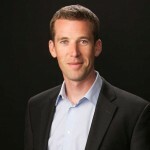 It was a fabulous experience – professionally run with lots of real world experience. Jason Miller is a CFII with more than 18 years of aviation experience, including thousands of hours of instruction given. 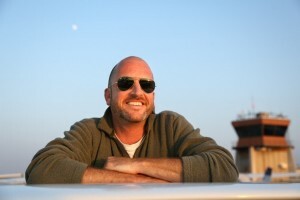 He is a member of the FAA safety team and a speaker for AOPA’s Air Safety Institute. 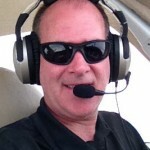 You can listen to Jason talk about his passion for developing standardized processes to help GA pilots fly safer on The Finer Points, his well-respected aviation-themed podcast. The course began at San Carlos Airport (KSQL) just south of San Francisco. 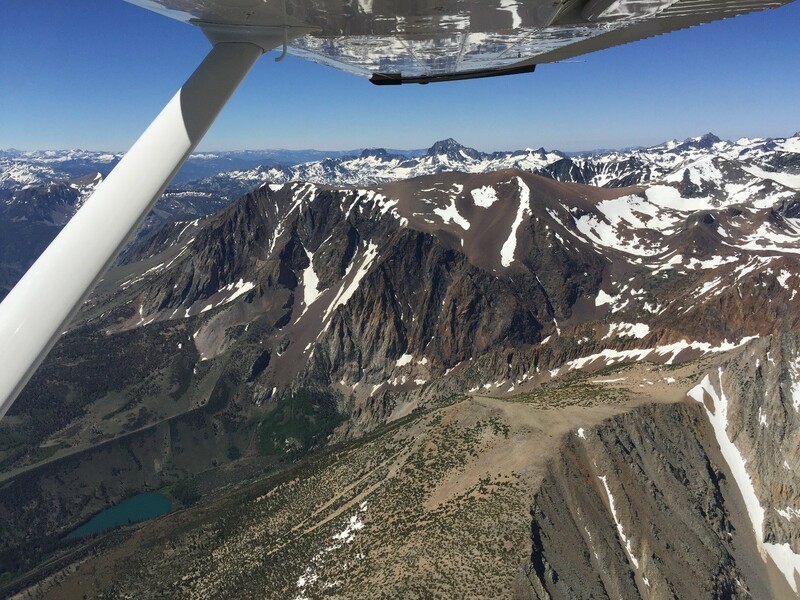 Although some pilots trained in their own planes, I flew in a beautifully equipped G1000 Cessna 182 based in Palo Alto (KPAO). We flew to Lake Tahoe, and then over the ridge to land at Truckee-Tahoe Airport (KTRK), elevation 5900 feet. My instructor was Geoff Papoport, a CFII teaching in the San Francisco Bay Area and the editor of The Finer Points Dispatch. 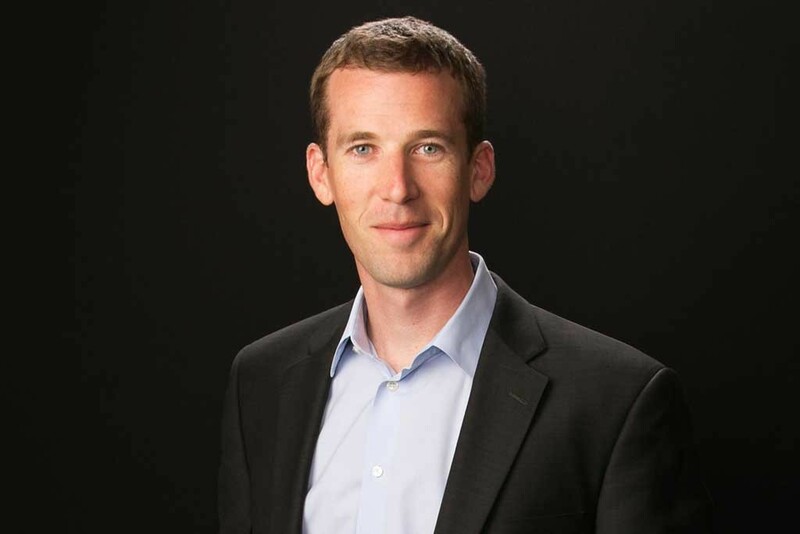 Geoff is a manufacturing engineer and lawyer; when he isn't flying or thinking about flying, he's at work as the general counsel of a San Francisco-based venture capital firm. Geoff is careful, methodical and very knowledgeable about mountain flying. And, he was patient (more than I was with myself), providing good coaching with my less-than-perfect high density altitude landings. We set up base camp just off RWY 20 at KTRK. 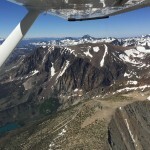 Survival training is part of the package for this mountain flying course. If you have to put down in a remote area you’ll need specific skills to stay alive until help arrives. 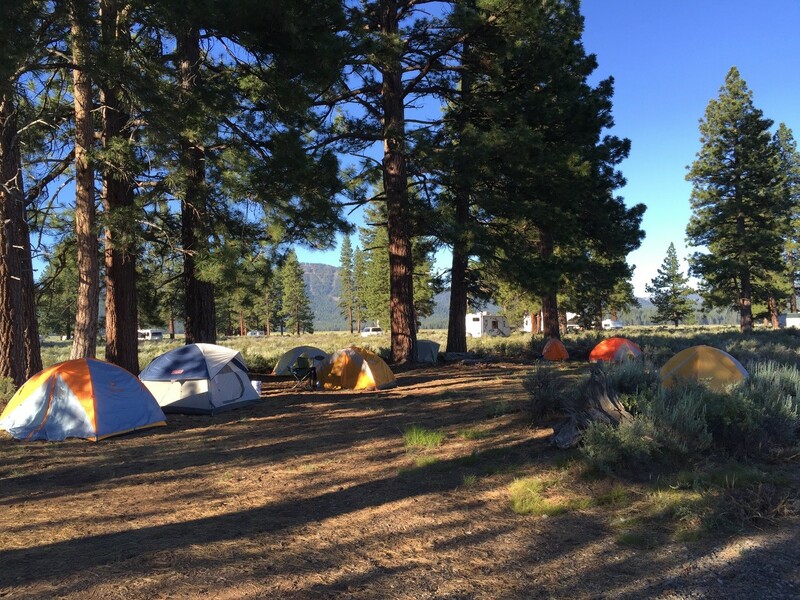 Dr. Howard Donner provided us with practical and specific guidance on how to survive if our plane were to go down in the back country. Dr. Donner is a CFI and emergency room physician who trains remote area first responders in wilderness medicine and survival. 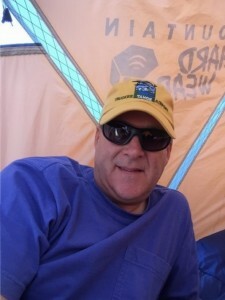 He also provides physician support to wilderness expeditions worldwide. He has been featured in two NOVA documentaries including Deadly Ascent, which chronicles mountain medicine and research on 20,320-foot Denali (Mt. McKinley). He spent three climbing seasons as a rescue doctor for the National Park Service at the 14,000-foot medical/rescue station on Denali. Dr. Donner also served for five years as a medical operations consultant for NASA, where he was involved in the design of the Space Shuttle and International Space Station medical systems. 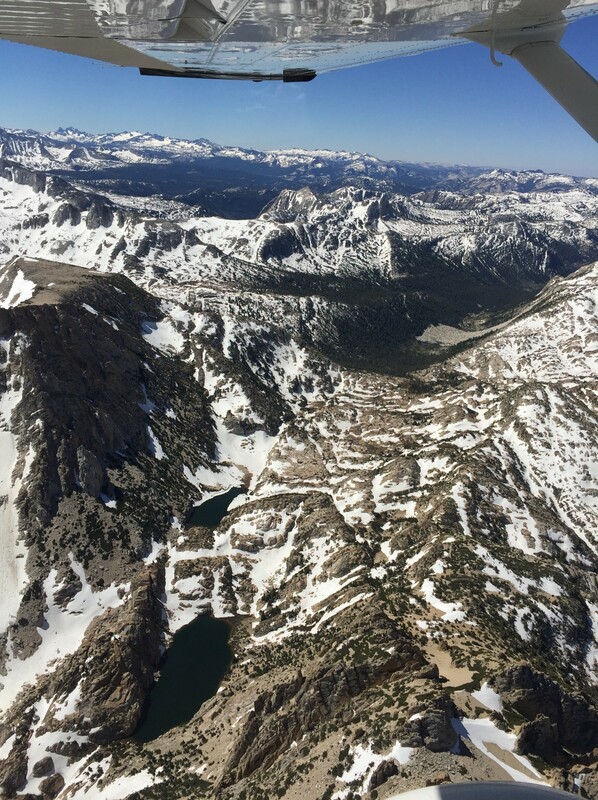 We started with some pattern work at KTRK to get the feel of take-offs and landings surrounded by high terrain and at high density altitude. KTRK was very active while we were there. The airport is home to a large glider club with almost constant glider activity on and around the airport. We also saw business jets bringing in vacationers, lots of big-wheeled back country tail draggers, a Chinook helicopter crew from Colombia doing firefighting practice (large dangling budget included) and active fire fighters battling nearby blazes. Avoiding all the traffic in the pattern added to the unique challenges of high altitude flying, which requires maintaining airspeed while avoiding big rocks. Following our acclimatization in the pattern at KTRK, Jason and his team of mountain trained CFIs provided us instruction on flying at high density altitude. They emphasized the importance of understanding local wind patterns and typical wind speeds, proper techniques for approaching and crossing ridges and always leaving yourself an escape option. 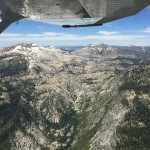 Departing with density altitudes close to and above 9000 feet with three souls on board yields a climb rate something less (a lot less!) than me alone in my IVP at sea level! However, we soon learned that catching an updraft with orographic lifting could yield climb rates upwards of 2000 ft/min. I usually travel on an IFR flight plan, but in remote areas at low level this isn’t possible. On the other hand, filing a VFR flight plan can enhance your chances of a timely rescue should one be necessary. 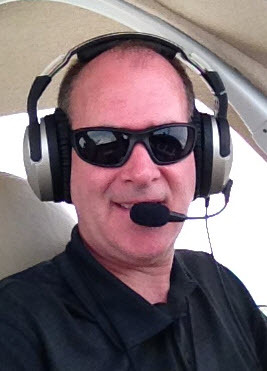 Since we had not filed one before departure, Jason challenged us to file and open a VFR flight plan while en route. This became almost laughable as I concentrated on flying the airplane while simultaneously playing twenty questions with Flight Service. The lesson was to file ahead and not wait until you really need it! 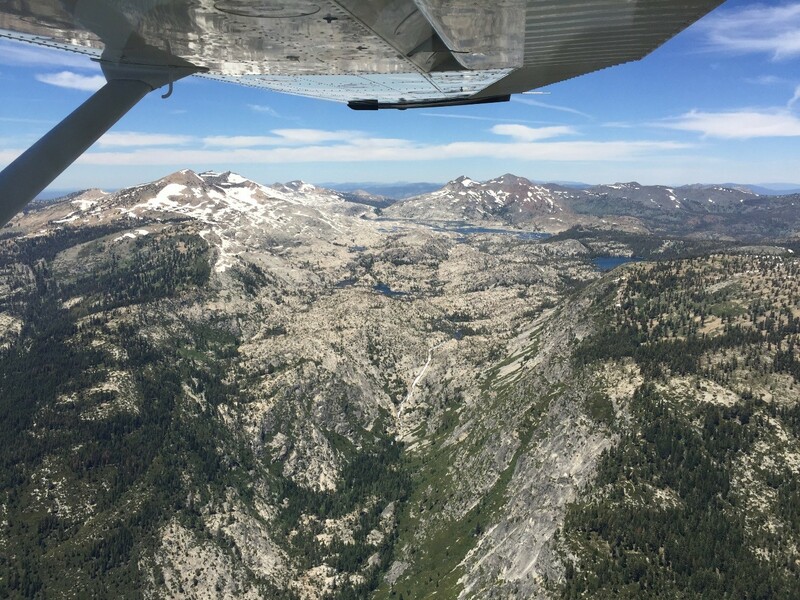 The map below depicts our flight track, with stops in Bryant (057), Mammoth (KMMH), Bishop (KBIH), Alpine (M45) and Lake Tahoe (KTVL). Along the way we flew through Buckeye, Tioga, Sonora, and Ebbets passes while navigating around several firefighting TFRs. Downdrafts can be deadly and we were always cautious when crossing a ridge; an updraft on the windward side is usually followed by a downdraft on the leeward side. Planning a way to fly out of the downdraft is always a top priority. This short video shows an approach and landing into Alpine Airport (M45). It’s a high altitude approach, dropping over a ridge, followed by a low pass to check out the runway and finally a landing. 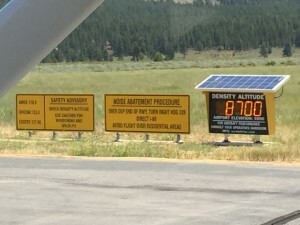 The downwind is particularly interesting since it is over the rugged terrain surrounding the airport nestled below at a field elevation of 6,671 feet. 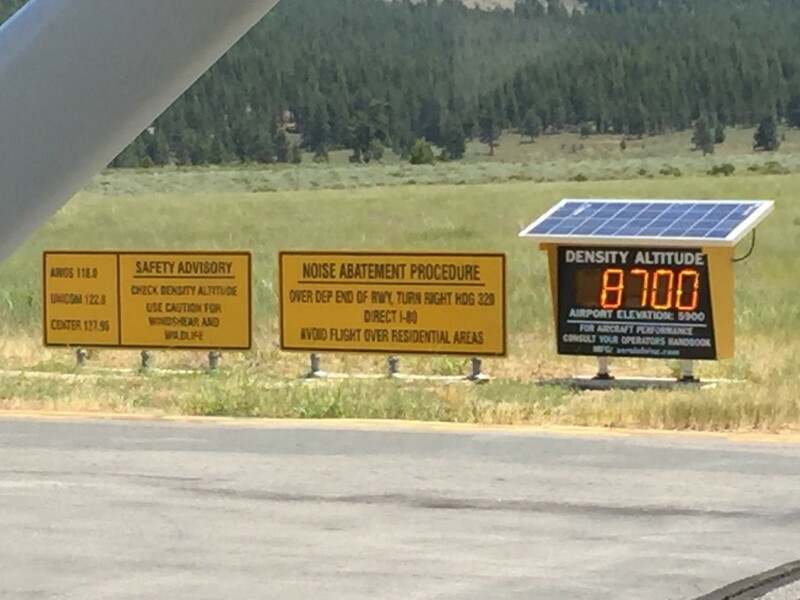 The density altitude when we arrived was about 10,000 feet. Overall, it was great fun and a great learning experience. Jason, Geoff and their colleagues organized and executed a challenging and educational program which I highly recommend to anyone who anticipates flying in or around mountains, or anyone who just wants to better understand how wind, heat and altitude affect your flying.